The primary function of the Spherical Plain Bearing PB Series is to support the mechanical rotating body, reducing the coefficient of friction in its course of motion and ensuring its rotational accuracy. It can be understood that it is used to fix the shaft so that it can only achieve rotation and control its axial and radial movement. The primary function of the Spherical Plain Bearing PB Series is to support the mechanical rotating body, reducing the coefficient of friction in its course of motion and ensuring its rotational accuracy. It can be understood that it is used to fix the shaft so that it can only achieve rotation and control its axial and radial movement. 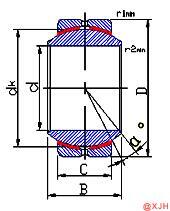 If the shaft does not have a bearing, the base does not work. Since the axis can move in any offset, the axis can only be rotated when it is supported. 1) Sliding contact surfaces: Steel vs. bronze. 2) Materials: Outer race is made of carbon steel, inner race is made of high chrome bearing steel, medium race is bronze. 3) Heat treatment: Without heat treatment on outer race and bronze race. Inner race is quenched (hardened), and surface plated with chrome. 4) Features of structure: With oil groove or oil hole. Outer race formed by extrusion. With a bronze race between outer race and inner race. 5) Properties: Self-lubricated, low friction, good wearability, self-alignment. Spherical Plain Bearing PB Series is installed immediately after unpacking to prevent contamination. The bearing is dirty and wiped with a cloth. Do not wash with trihydrosilane or high silicon chloride solution. It is recommended to install the spherical bearing with an auxiliary tool to avoid deformation caused by the impact. The hammer and the cleaning fluid are used to easily damage the sliding contact surfaces of the outer ring and the inner ring, so that the bearing loses its function.